#277 Sampeng Lane, Fabric House, features some new lines of fabric. They have 100% Cotton Colors by Palette Pleasure, at 99 baht per meter, and Creative Fabrics Designed by Freedom House UK, in a cute ‘crayons’ print at 99 baht per meter. They have novelty prints with cats, owls, and animals. A pack of low loft batting suitable for table runners is 75 baht and contains 1 yard. 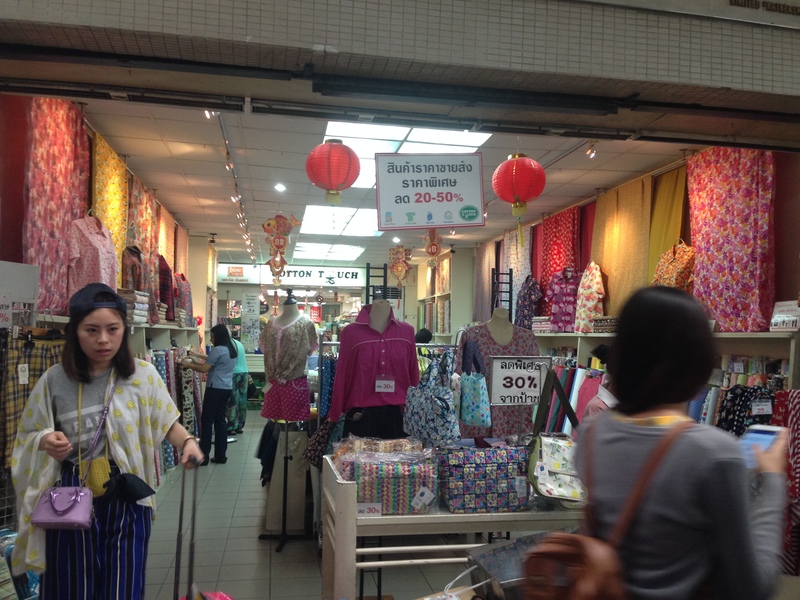 They have quilted cotton at 210 baht per meter, and also cotton spandex in bright colors at 210 baht per meter. #150 Sampeng Lane, Chuan Hua. 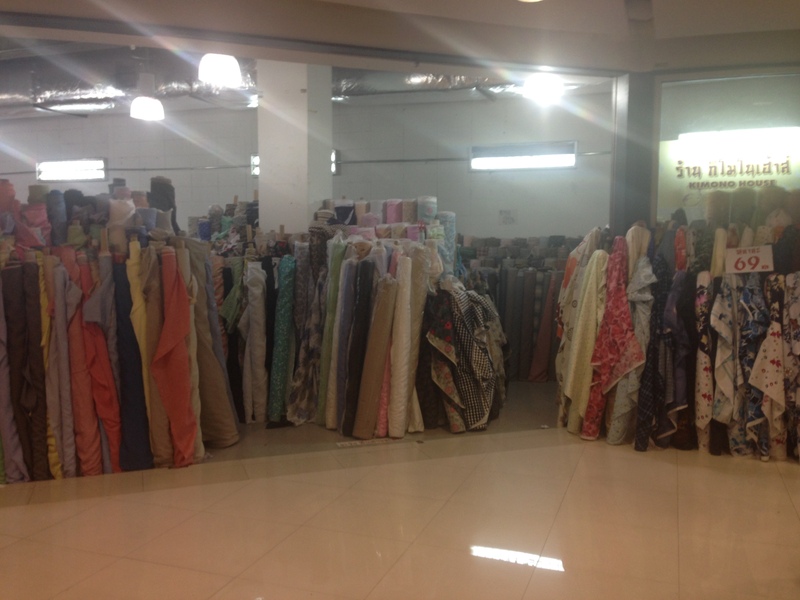 They have cotton fabric at 3 meters for 100 baht, 4 meters for 100 baht, and 40 baht per meter. I saw some cute fabric in a glasses and mustache print, and the same Hawaiian prints they’ve always had with an occasional Jinny Beyer leftover from before. There are some misprints which are great for art quilts because they are unique. #146 Sampeng Lane, Eung Hang Kim. This is a notions shop where you can pick and choose threads in different colors, and they give you an empty box to fill. A box of 12 spools of Venus polyester thread is great for sewing quilts, at 140 baht. #159 Sampeng Lane, S.S.T.Textile Co.,Ltd. 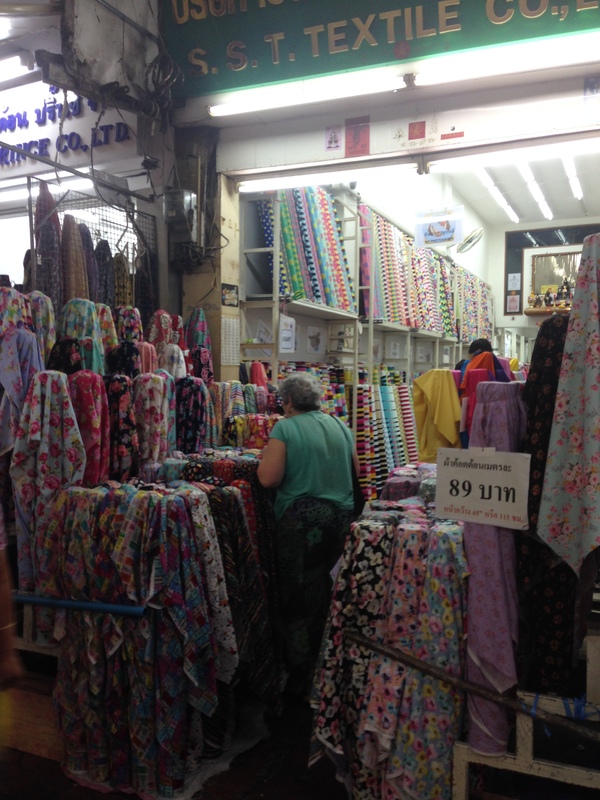 They have cotton fabric at 89 baht per meter. Their novelty fabric is really cute, with postage stamps, cupcakes, florals, stripes, polka dots, musical notes, and pretty border fabrics. 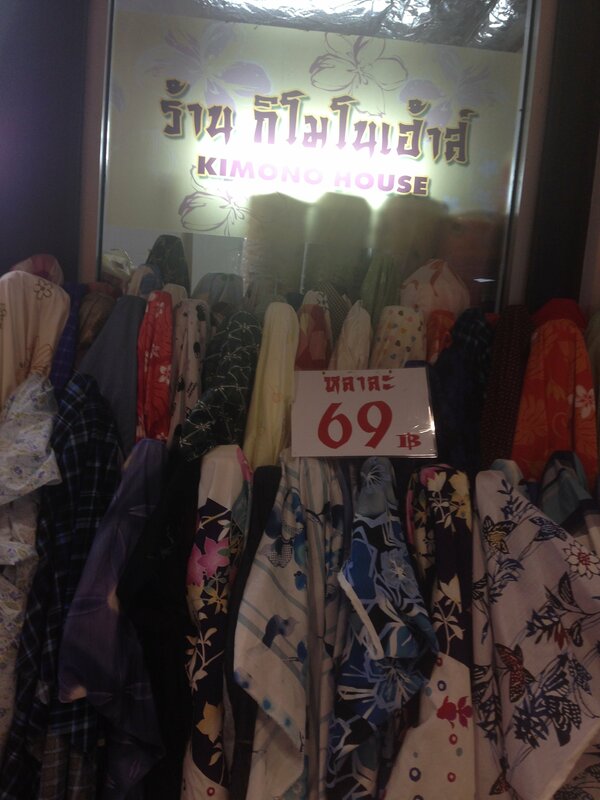 Kimono House on the corner of Yaowarat and Maha Chai Roads, diagonally across the street from Starbucks, has fabric priced at 120 baht per meter, or 110 baht per yard. This is the place to find a wide variety of quilt fabric. The lines of fabric include Carnival by Jinny Beyer, Kona Bay Fabrics, RJR Clover Collection, XOXO Collection, Fall 2014 Collection, Kaufman Dari Design Studio, Patrick Lose suds, stars and argyle, and French General for Moda. It’s really fabulous! Another view of Kimono House on the corner of Yaowarat and Maha Chai Roads, diagonally across the street from Starbucks, with fabric at 69 baht per yard. This shop is just about overflowing with quilting cotton. There is lots more than there used to be. #258 Sampeng Lane, Belleboo. They have novelty cotton prints with the Eiffel Tower, florals, cars, elephants, and lots of stripes and polka dots. All at 89 baht per meter. hi jill , how are you ? i ma interested bangkok cotton fabrics at a wholesale rate and also thailand laces .. can you get in touch with me ? Hi Jill, I pan on a day trip for fabric hunting in Bangkok. Would it be ok to go on a saturday? I will only be in Bangkok for a couple of days! Probably will hire a driver for the day so we could visit to most of the places in one go. Yes the shops in Chinatown and Pahurat are open on Saturday and Sunday. Have fun! Great blog. Thank for sharing. I need to buy single jersey printed. About 100 meters per colour or print. 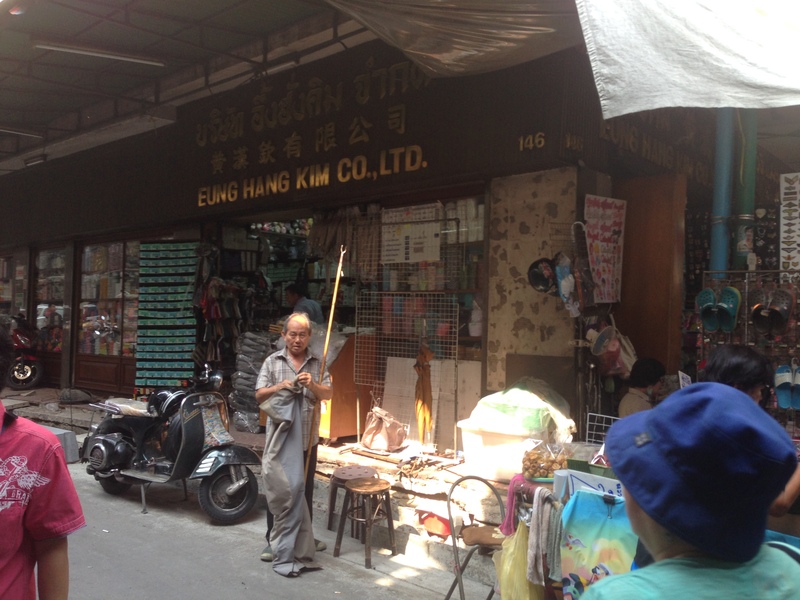 There is a market for cotton knits in Suksawat, Bangkok. I don’t know much about it, but it’s the place to go for tee shirt fabric. Thanks for your response Jill. Could you also advice me where I can get good shirting? I would need about 100 meters each colour and in a few colours. Hello Jill C, I like to find out is there any online shop that do international shipping? Hi Jill, thanks for your amazing info. Is there an online shop for fabric and accessories for thailand? would you happen to know if there are any one-on-one beginner’s sewing lessons in Bangkok? I will go Chiang Mai next week, any recommend quilt shop in there? Dear Jill, any idea which shop sells white embroidered cotton and/or white egyptian cotton? I plan to go to Sampeng in early Sep. Thank you in advance. Hi Jill, thank you for information. I’m leaving for Bangkok in a few days. I would love todesign my own Kimono’s. Do you know a place where they also produce or customize kimono’s/ bathrobes? Hello Jill I live in Dubai and am visiting Bangkok soon. Would you advise I buy sewing machine trolley from there as it is very expensive here and not available in India. Thanks a ton for your other insights. I don’t think they have it here either. https://bkkquilt.com/2009/07/31/rotary-cutters-and-mats/ I haven’t been in a while. Dear Jill. Thanks sooo much for your blog! I loved the fabrics and gonna go again tomorrow. A real bargain haven! Godbless! Hi! any idea where to buy the sequined fabrics? where would it be cheaper phahurat road, india emporium or china town? Hi Jill, we are moving to East Pattaya this Summer. 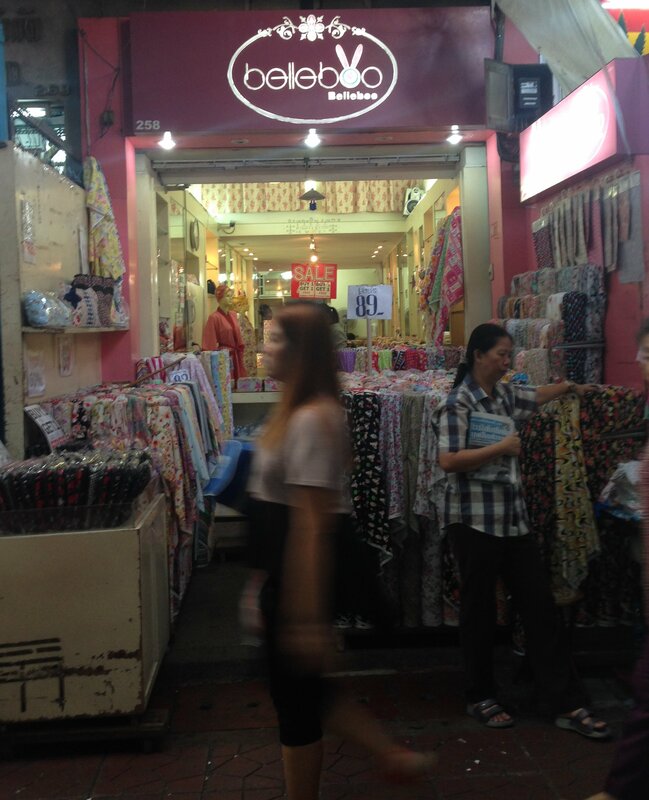 I stumbled upon your site and it has given me hope to find sewing supplies and fabrics in Thailand 🙂 Are you only familiar with fabric shops in Bangkok? Is there a sewing community I could connect with? Yes, definitely will join them. Thanks! Hi, does anyone looking at this site happen to know the names of the two shops across the street from terminal 21 mall at asok BTS? There is a nice fabric shop on that corner, and a small but decently stocked notions shop around the corner. I’m a longarm quilter in St George, UT. One of my customers asked if I would continue to quilt for her if she mailed her quilts. Needless to say, that would be crazy expensive for her. 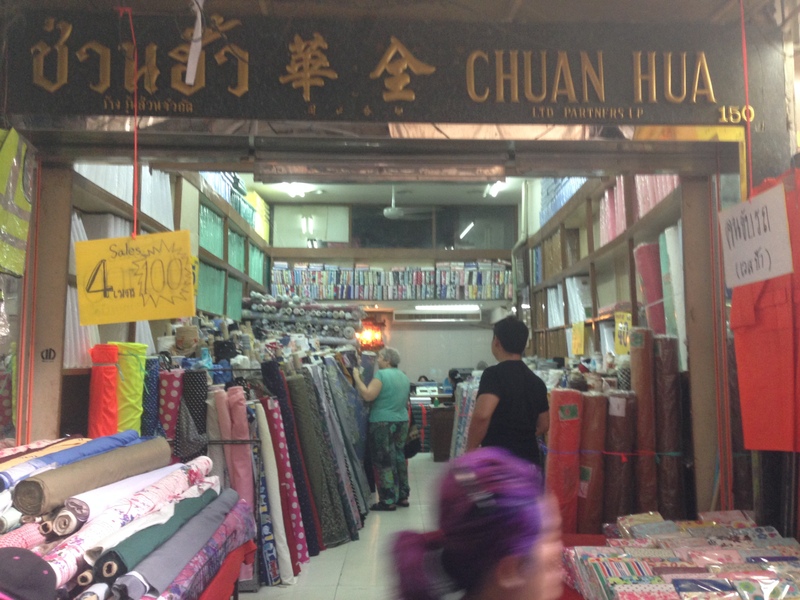 I googled, thinking there might be quilters in Thailand – and here I am! There aren’t any machine quilting businesses in Thailand. That’s why we learned to machine quilt our own quilts here, out of necessity. If you’re interested in getting some hand quilting done, you can contact me through these comments. It would involve mailing your quilt to Rayong, Thailand, to Khun Tiew and Our Home quilters. Thanks! Thanks, Jill. I’ll pass this along to my friend as well as alert her to your site! I am looking for some factories that can produce 2000-3000 quilts/day. We have already had designs and all the work that factories have to do is priting our designs into Quilts. Can you recommend me some factories that have large capacity and can offer us a competitive price? Hi Jill, thanks for the updated information. I went looking on our last visit to Bangkok, and was amazed at what is available at what prices, and just didn’t have room in my suitcase for any more. I found some wonderful bargains. I will be back later this year in September, and will be checking out some of these wonderful places. Quilting fabrics in Australia are so expensive, and these are a great find.